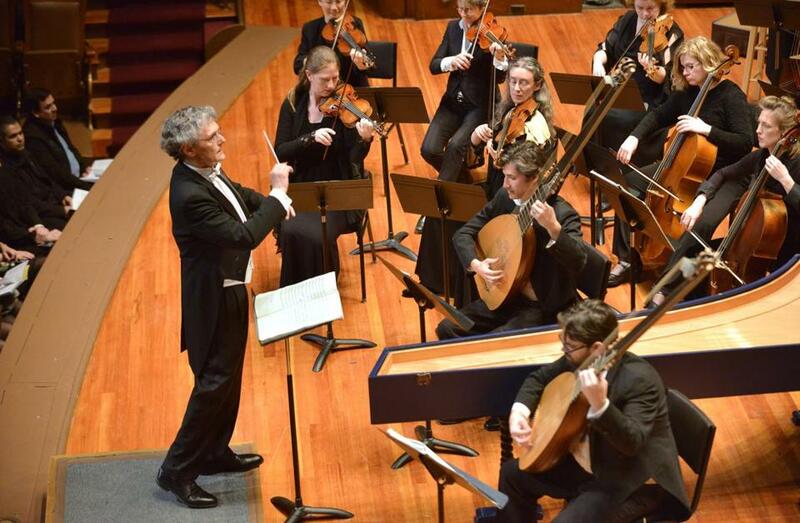 Martin Pearlman leads Boston Baroque Friday night at Jordan Hall. The piece that has come down through history to us as Monteverdi’s “Vespers of the Blessed Virgin” is known for its majestic dimensions, requiring an array of forces larger than any other contemporaneous piece of church music. Somewhat less well observed, though, is how sparingly Monteverdi deploys those forces, entrusting many of its most memorable passages to only a small group of singers and instrumentalists. Many of the most memorable passages in Boston Baroque’s admirable performance of the “Vespers” on Friday night were the more intimate, less grandly scaled ones. In part that was due to the superb vocal soloists the group enlisted. Tenor Thomas Cooley invested “Nigra sum,” the work’s only solo vocal piece, with operatic intensity, his voice sounding warm and radiant as it played off the palpable texture of the pair of theorbos (bass lutes) played by David Walker and Michael Leopold. The other tenor was Aaron Sheehan, whose voice was lighter and more dynamic, and the contrast was perfectly shown off during “Duo seraphim,” in which they sang across the Jordan Hall balcony from each other. (A third tenor, Jonas Budris, joined in from the stage.) The two sopranos were also exceptionally well matched: Yulia Van Doren’s voice airy and effervescent, Teresa Wakim’s slightly darker and earthier. They entwined beautifully during “Pulchra es,” the vocal ornamentation languid and beautifully controlled. Two of the chorus’s basses, Dana Whiteside and Bradford Gleim, ably handled the baritone duties. The chorus, oddly tentative and indistinct in a few spots, was especially good in the back-and-forth volleys of “Nisi Dominus” and “Lauda, Jerusalem.” Violinists Christina Day Martinson and Sarah Darling were outstanding in their duets. The sackbuts and cornets did yeoman work throughout. Much has been made of the structural unity of the “Vespers,” the way each movement is built around a specific chant. But another idea emerged during Friday’s performance: how discontinuous many of those movements are, with frequent and abrupt changes in texture, rhythm, and tempo. Shaping each one into a coherent whole is no easy task, but it’s something at which Martin Pearlman, Boston Baroque’s music director, excels. Nowhere is this more difficult than in the immense closing “Magnificat,” in which florid instrumental and vocal writing, chant, and polyphony intermingle. The performers brought all of it off confidently, and the closing Amen exuded the kind of opulence that has kept this piece at the forefront of sacred music, more than four centuries after its creation.